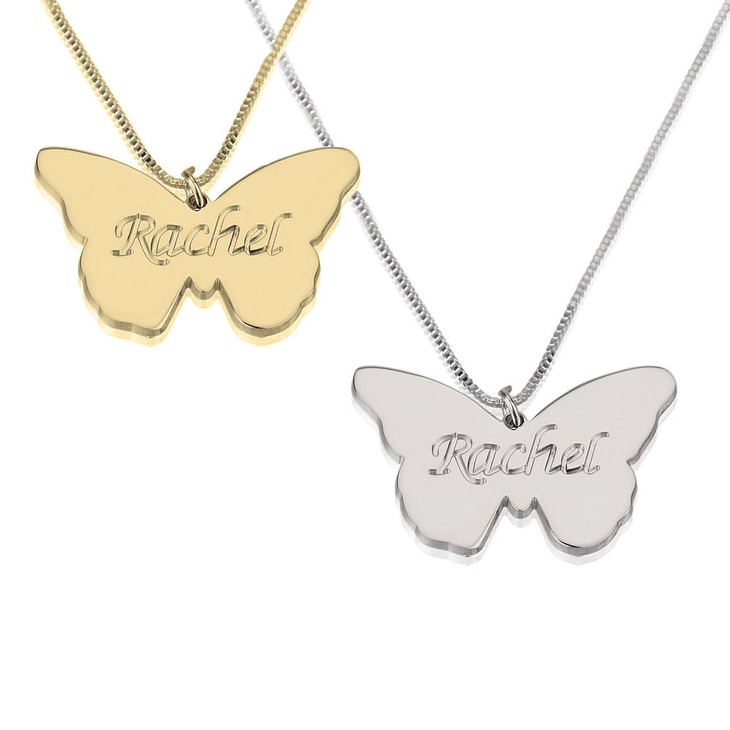 For an elegant look, there is the option of getting the Sterling Silver Butterfly with a Name necklace. Sterling silver is a favourite for many people, and this is because it is not only glamourous, but also because adds a touch of glamour to the entire outfit. 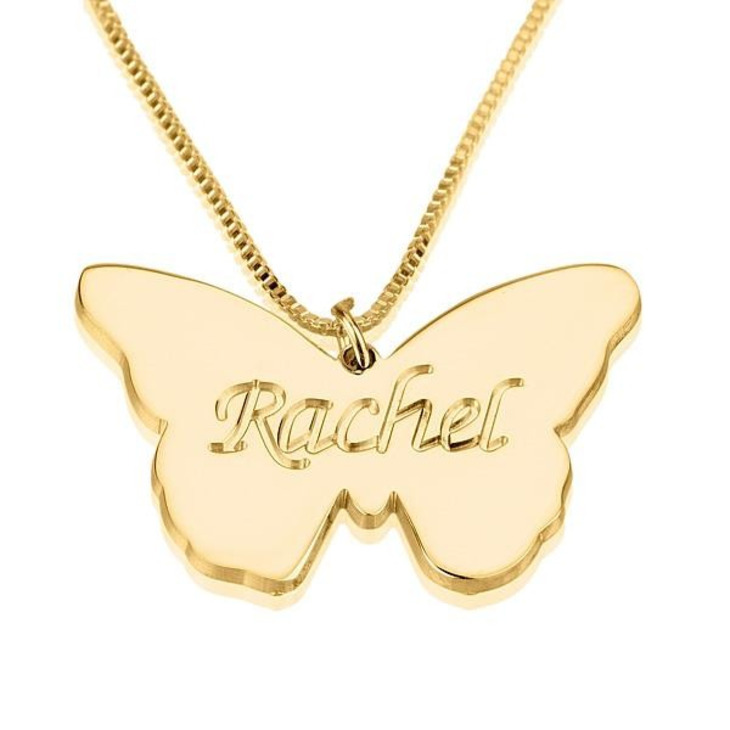 This name necklace is a unique one for the simple reason that the name is engraved on the butterfly. Consequently, the size of the butterfly will be dependent on the length/number of letters of the name. The design of the butterfly is breathtakingly simple so take this opportunity to get a gift for you or for someone that you treasure. The great thing about getting this necklace is that it comes with a lovely box for the purposes of gifting. Deliveries take up to a fortnight, and while this may seem like a long period, it is because the necklaces have to be custom made. Another important factor to take note of is the fact that our products are free from defects, having been inspected by the team in our quality assurance team. This is done to ascertain the quality of the necklace before it is shipped to the client. 30mm x 20mm / 1.2" x 0.8"
This item was a birthday gift for an elderly woman. She cried when she received it because it was so beautiful. I had a question about the item so I contacted customer service. They were so kind and helpful. I was impressed with how easily the matter was resolved. Thank you so much. I purchased this as a gift for Mother's Day for a dear friend. She cried. She lived it. Thank you. I am in love with the necklaces I got. I got two sterling silver butterfly necklaces with names engraved on them. They are absolutely perfect for the flower girls in my wedding! I am so excited to give them their necklaces! :) So happy! Great quality necklace. Very pleased with this purchase. Got so many compliments. I highly recommend this site to my friends and family for affordable good quality jewellery. I was very satisfied with my overall experience from start to end! I ordered this necklace for my flower girl, I got married last month and decided to get it at the last second. The price was very reasonable for the quality of the product. I needed the necklace in just a few days of placing the order, I was almost positive I wouldn't get it in time for the day I needed it, but to my amazement the package arrived the day before I needed it & it shipped from Israel!!! Thank you for your amazing service, the experience was phenomenal. I felt very valued as a customer & would recommend this to anyone who is considering purchasing.